A Normal Dive? No, An Incredibly Rare Sight Of A True Nightmare! Are you ready for a dive? You are probably aware how fascinating the ocean floor could be. The place is filled with colorful rock and coral formations and with exotic marine life… but not only. Check what a group of scuba divers have seen when in the waters off the Australian coast! The image they saw was totally horrifying! 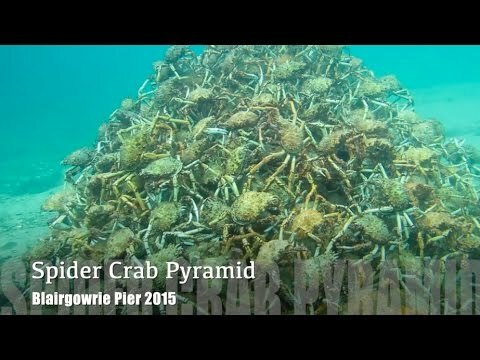 What they thought to be a coral formation was moving and turned out to be an entire pyramid of spider crabs, holding tightly to one another, migrating to another place. Is That A Coral Formation? No, Crabs! The Crabs Looked As If Climbing, But They Were Migrating To Another Place. Have A Closer Look At This Incredibly Rare Sight! OMO- A Rare White Giraffe- Could This Be The Reincarnation Of The Iconic Late Singer David Bowie? Guy Visits Thrift Store- Pays 2 Bucks For Photo- Surprize! Its A Genuine Billy The Kid Photo Worth FIVE Million Dollars! America Asks Few Thought Provoking Questions From Australia! Do You Have An Answer?